Blend all ingredients in a blender, and set aside. Preheat a grill or cast iron skillet to medium heat. Remove and discard the stalky ends of the broccolini, then drizzle with extra virgin olive oil, a little salt, and a few cracks of fresh black pepper. Grill until lightly charred, turning every couple minutes. 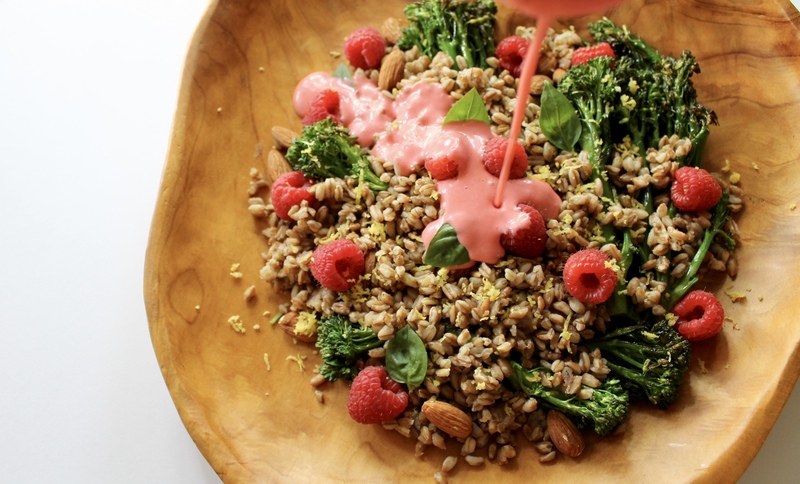 Let the broccolini cool, and then add it to the farro. Toss together with raspberries and almonds, then drizzle the vinaigrette. Top the salad with the remainder of the lemon zest and basil, and a quick pinch of salt! This can be served chilled or at room temperature, and is beyond delicious for those last few magical, summer nights.